It’s been 50 years since Mazda introduced its first car for the Canadian market, the R-100 Coupe. To celebrate the 50th Anniversary, the automaker is giving away 50 new Mazda vehicles. If you buy a 2018 or 2019 model, you automatically get the chance to win its MSRP value. Now is the perfect time to become part of Mazda’s rich history, by purchasing (or better yet, winning) a car of your own. Mazda can trace its roots back to 1920 in Hiroshima, Japan. It wasn’t until 1968, however, that the automaker began formal operations in Canada. There have been many notable moments in the company’s history since. 1968: Mazda begins operation in Canada by introducing the R-100 Coupe. 1971: Just three years after entering the Canadian market, Mazda Canada hits 100,000 sales. 1974: Ford and Mazda become partners. The joint venture would last until 2015. 1978: The iconic, rotary-power RX-8 is introduced. 1991: A new record of 50,000 sales by Mazda Canada. 1995: Mazda introduces the Miller cycle engine (the first-ever in a production car) in the Millenia. 1997: The winged “M” logo, which is still used today, is introduced and fitted to all Mazda vehicles. 2002: The million sales mark is reached by Mazda Canada. 2010: Mazda starts focusing on hybrid development using technology supplied by Toyota. 2014: The now famous SKYACTIV technology is first introduced on Mazda vehicles. 2016: Mazda celebrates 2,000,000 vehicles sold in Canada. 2018: The 2018 Mazda CX-5 is voted the “best small utility vehicle” by the Automobile Journalists Association of Canada. 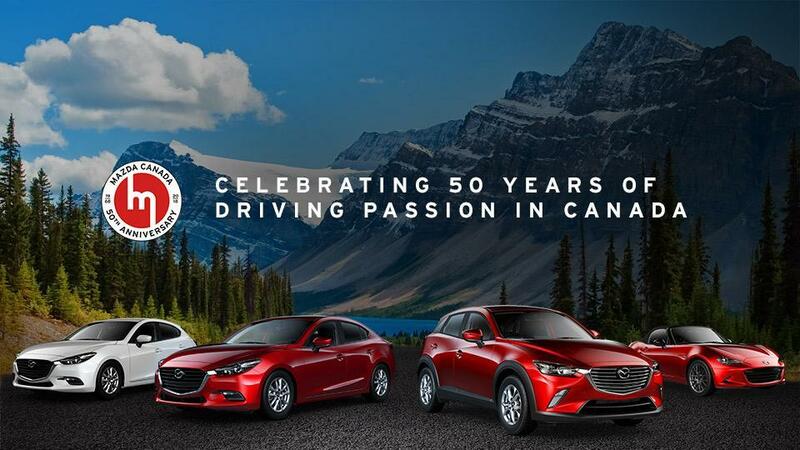 2018: Mazda Canada celebrates half a century of success with its 50th Anniversary. 2018 Mazda3: Sleek body lines and unmatched performance define the Mazda3 compact sedan. Key features include a SKYACTIV engine, G-Vectoring control, and the i-ACTIVESENSE safety suite. 2018 Mazda3 Sport: The Sport Model adds hatchback utility to the class-leading Mazda3. Like its sibling, the 5-door model comes equipped with SKYACTIV engine, G-Vectoring control, and the i-ACTIVESENSE safety suite. 2018 CX-3: No other compact crossover SUV has the style and capability of the CX-3. Vehicle highlights include i-ACTIV All-Wheel Drive, G-Vectoring, and a versatile cargo area with customizable storage. Each Anniversary Edition vehicle offers a list of special features including leatherette-trimmed upholstery, a Bose audio system, advanced keyless entry and automatic climate controls. If you want to be one of the lucky winners of a new car, come down to Yarmouth Mazda. All 2018 and 2019 models are eligible for the Mazda 50th Anniversary giveaway, which allows you to win the MSRP of your new vehicle. The contest only lasts until August 31, 2018. Be sure to visit us soon for your chance to win (no purchase necessary). For further details, check out the official contest rules.